Making gears at home is quite difficult and a lot of tools and machinery are needed. At least you need a rotary attachment for a mill or lathe with a specialized tool (involute gear cutter). Another drawback is that to cut a specific gear you need a specific size of involute gear cutter, so a complete set (normally 8 pieces, around 100 bucks) is needed. Also in this case, only the hobber, quite difficult to find, at least requires 80 bucks. Solution? Not for helical or spur gears, but there is a particular set of gears, called worm gears you can machine at home. From wikipedia: "Worm-and-gear sets are a simple and compact way to achieve a high torque, low speed gear ratio. For example, helical gears are normally limited to gear ratios of less than 10:1 while worm-and-gear sets vary from 10:1 to 500:1"
Is possible to find this set of gears in telescope aligning mechanism or in a mill 4th rotary axis. In this set the two axis are perpendicular, and only one is driving. The drived gear can be machined easily using only a lathe, and the other one may be simply a machine screw with imperial, metric, acme or custom thread. Is only needed to have the a screw tapper. Finally a link of great kinematics models. From KMODDL site: "KMODDL is a collection of mechanical models and related resources for teaching the principles of kinematics--the geometry of pure motion. 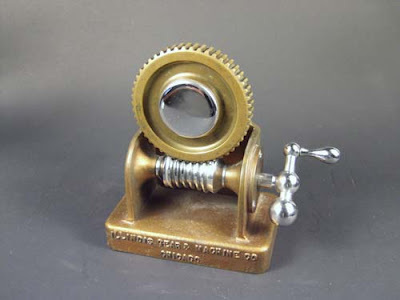 The core of KMODDL is the Reuleaux Collection of Mechanisms and Machines, an important collection of 19th-century machine elements held by Cornell's Sibley School of Mechanical and Aerospace Engineering."